The shoulder can be particularly susceptible to injury because of its great mobility and free range of motion through space. One of the more serious shoulder joint injuries is a dislocated shoulder. About half of all major joint dislocations in the emergency room are dislocated shoulders. A dislocation occurs when one or more bones comprising a joint become dislodged and come out of place and do not go back into position on their own. A dislocation is typically a serious injury that can be accompanied by a lot of damage to the surrounding structures of the dislocated joint. Primary care physicians are typically not equipped to handle treatment for this type of injuries to the shoulder joint, and, as result, often refer their patients to orthopedic specialists like Dr. Meier. At Meier Orthopedic Sports and Regenerative Medicine, we specialize in treating injuries of the shoulders and knees, and Dr. Meier is world-renowned for his ability to perform advanced regenerative medicine treatments and innovative arthroscopic shoulder procedures. To find out how he can help with your treatment after injury, contact us at 310.736.2793 to schedule an appointment for orthopedic services and sports medicine. medlineplus.gov also provides information about dislocated shoulders. A dislocated shoulder occurs when the upper arm bone (humerus) becomes displaced from the shoulder blade (scapula) at the glenohumeral joint of the girdle. When the humerus does not remain displaced, or only slips partially out of joint and then back in, this is known medically as subluxation. Conversely, separated shoulders (also known as an AC joint separation) refer to the separation of the shoulder blade from the collarbone (clavicle) at the acromioclavicular (AC) joint. So, despite the similarity in name, shoulder subluxations/ dislocations, and separations occur at two different joints within the girdle and represent two entirely different injuries. Anterior (forward) dislocations of the humerus represent the vast majority of upper arm dislocations, with over 95 percent of reported cases. These injuries can cause damage to the axillary artery and axillary nerve, which in turn leads to a weakened or paralyzed deltoid muscle in the shoulder joint. Patients with forward dislocations, along with damage to the nerve, will have difficulty moving the arm even a little bit away from the body. Posterior (backward) dislocations are the next most common type of dislocated shoulder, occurring in about four percent of cases. The type of dislocation experienced usually depends on the position the arm was in when it sustained an injury and the direction of the force against it. Inferior (downward) dislocations are the least likely type of dislocated shoulder joint, representing less than one percent of all dislocation cases. Patients who suffer a possible shoulder dislocation injury should seek prompt medical attention at the emergency room where immediate treatment will focus on returning the joint to its normal position. This is done through a process known as reduction, during which bone and joint are manipulated by a doctor back into their correct places. If reduction cannot be achieved, surgery is likely required to return the joint to normal. Once the joint is placed back in the socket, X-rays are performed to determine if any structural damage has occurred. This will also confirm whether reduction has been successful, or if any bone fractures were also sustained. The arm should be kept in a sling until a consultation with an orthopedic surgeon can take place. Following a thorough evaluation, Dr. Meier will determine whether regenerative medicine, such as platelet-rich plasma therapy or prolotherapy, may be beneficial for the healing process. In many cases, PRP or other forms of regenerative medicine can help boost the body’s ability to recover while also reducing pain and inflammation. Some shoulder joint dislocations will require surgery to repair damaged tissue in the shoulder as well as to restore stability to the joint. At Meier Orthopedic Sports and Regenerative Medicine, we utilize arthroscopic surgical techniques to tighten the shoulder capsule and repair the damaged muscle and tendon tissue. Arthroscopic shoulder joint surgery is a minimally invasive surgical technique used to repair injury and trauma to structural tissues (ligaments, tendons, and cartilage) in the shoulder joint. Several different arthroscopic procedures can be done within the area at the same time if need be, and they are typically done under general anesthesia in an outpatient setting. Dr. Meier usually performs shoulder arthroscopy at La Peer Health Systems in Beverly Hills. In arthroscopic surgery, small incisions are made so that tiny surgical instruments, including an arthroscope (which has a light and camera on the end that connects to a TV monitor in the operating room), can be placed inside to repair damaged shoulder joint tissue without having to make a large incision to “open up” the joint. Following the procedure, Dr. Meier may administer cutting-edge regenerative medicine treatments to help the body recover faster with reduced pain and inflammation. 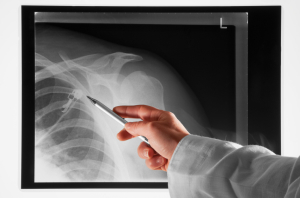 What Kind of Doctor Can Best Treat a Dislocated Shoulder Joint? A general practitioner’s office typically does not have the equipment necessary to treat a dislocated shoulder. It is best to head to an emergency room if you think you have recent orthopedic injuries or dislocations. In severe cases, surgery may be required to properly replace and realign the shoulder joint, and restore proper function, and this requires the attention of an experienced orthopedic surgeon. If you suspect you have dislocated your shoulder joint, it is important to see a good orthopedic surgeon like Dr. Meier. The damage from a dislocated shoulder joint can either initially be very severe or become more serious over time, or the damage may even be irreversible if left for too long. A surgeon experienced in orthopedics needs to examine the extent of the damage in order to determine a proper course of treatment. Contact us today at 310.736.2793 today to schedule a consultation with a Beverly Hills orthopedic surgeon. Next, read about Rotator Cuff Surgery.